If you want to be a writer, you need to realize that there is a certain degree of having the gift of writing and a certain amount of knowledge that needs to be learned. The part you learn helps you fine tune the gift and improve what you are already good at. Gotham Writer’s Workshop: Writing Fiction is a book to do just that. This is a non-fiction book that is designed to help you as a writer improve on your art. Chapters cover characters, plots, descriptions, dialogue, setting, voice, pace, theme and drafts. It is full of suggestions, tips, exercises, and experience as well as a writer’s cheat sheet. I found myself highlighting quite a bit of it and marking pages to reference later. Each chapter is written by a different writer who gives you their experience in that particular area. I loved how the writers were honest on what they did wrong as a new writer and what they are still learning. It gives a new writer hope. There is nothing useless on any of the pages. Everything said is so helpful and can be used. 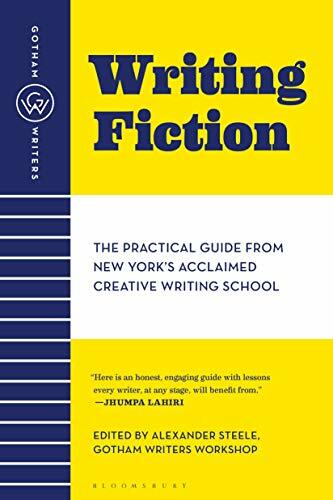 This is a book you’ll find yourself going back to and referencing many times if you are a serious writer. When you get this book, make sure you have pencil and highlighter ready to go. You might even want a notebook to work on the exercises. This would be a great book for a writing club to read and discuss. It really is a very good book on writing. Some of it's just silly (even my fiction teacher says so), but a lot of it is useful, and it can definitely serve as a good checklist/guide/reference when writing. Whether you have questions/doubts on things like setting or dialogue or if you're uncertain what to do with something once you've finished it, this book can probably tell you something. But I still believe that there's not always a wrong or right way to write, and this book actually says that too. For all the general rules and guidelines it gives you, there's always a note at the end of the chapter talking about the exceptions and the ways you can break the rule if you so desire. I appreciate this.